Berston Field House in Flint, MI, listed as an historic site by the State of Michigan. I’ve never read “On this day in history, an armchair quarterback accomplished this…” Maybe there will be a Kickstarter project for it. In the early 1900s the armchair quarterbacks criticized college football, in the words of the New York Times, for excessive mayhem and homicide. Teddy Roosevelt is credited with saving the game. The Great Game outside the stadium walls is another matter. I didn’t see armchair quarterbacks, just more of Graham Greene’s whiskey priests and homeless alcoholics, when I stopped to take a picture of the Berston Field House. 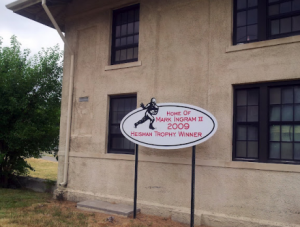 The historic site has as much athleticism per square foot as most any place in the nation. The gym on the north side of Flint is where Claressa Shields trained for the upcoming Olympics in London. A film crew from LA has a Kickstarter project to help finance a documentary about her boxing quest and fight to become someone. A century of football couldn’t equal the mayhem and homicides around Berston. There are no commissions and editorials demanding answers and help for anyone around this gym. Homicide detectives, college recruiters, and whiskey priests are about the only ones coming here. Claressa Shields is only 17. She’s the first female boxer in Olympic history and the youngest American Olympic boxer in 40 years. She credits a faith in God. There are times when the only one in your corner might be the whiskey priest. Many boxers come from dangerous areas and say the ring is really the only place they felt safe. There aren’t many options here. You either get in the ring or run for the weeds that are growing high around Berston. The first impression is that this is no place for a teenage girl. I’m referring to the neighborhood, not the boxing ring. Heisman Trophy winner Mark Ingram’s stiff arm is a way of telling everyone to leave me alone. While most here run for the weeds, he ran for the endzone well enough to turn pro at it. @Bill_George but they reported everything to police and outside lawyers. How is that a cover-up? But Paterno did report what he was told the very next day to both the president and the university’s outside counsel. They also informed the charity which investigated and found not enough evidence. Campus police investigated Sandusky as did child welfare case workers. Sandusky was a predator who conned everyone. Around here, fighters learn to keep their gloves up long before entering the ring. Dust, sweat, and blood are in abundance around Berston Field House.